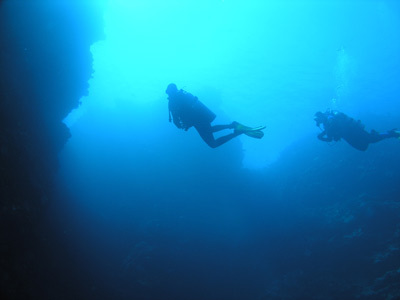 When scuba diving in Port Vila, Vanuatu, one of the things that has always struck me about this place is the great variation of the diving. There are not only reefs to dive, there are shipwrecks, both natural and scuttled, a famous aircraft as well as much more. 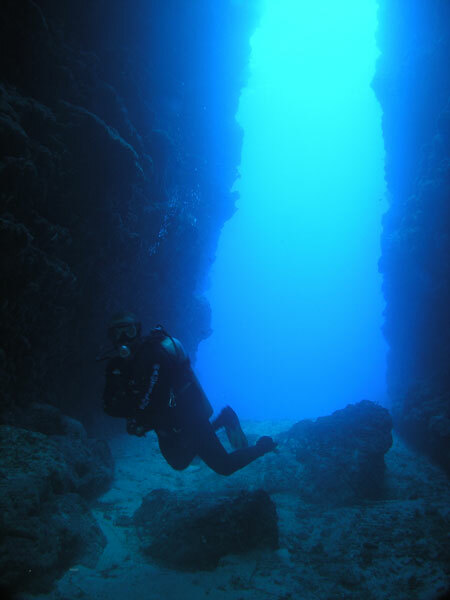 One of the reef dives is Cathedral Caves. This is a cave that starts off in the ocean and ends up with a pool behind the main rock platform. It is a bit similar to one in the Solomon Islands (Munda I think). 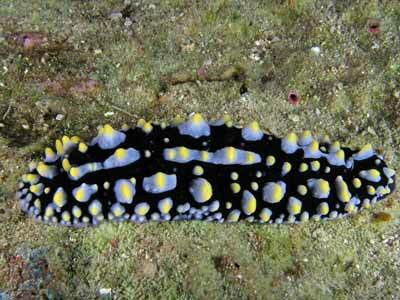 This site is the furtherest dive site normally dived by the Port Vila dive operators. 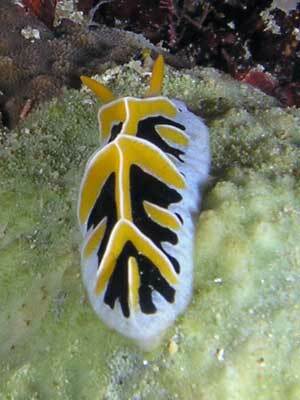 It is located right on the western-most point of the southern headland of the entrance to Mele Bay and Port Vila. This is called Pango Point. It takes about 45 minutes from the Nautilus dive shop. 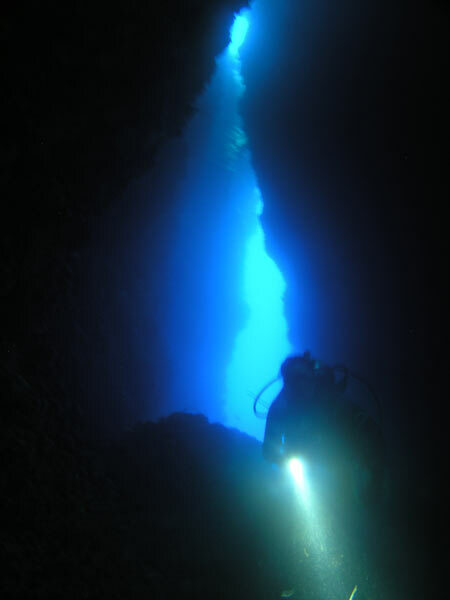 This dive is done as a dive into the cave and then a drift to the north along the reef to another mooring. Off the tip of the point at GPS S17° 46' 50.2" E168° 15' 24.0" (using WGS84 as a datum) is the entrance to the cave. You will see that on the rock platform (coral I suspect) is a fissure that runs back into the platform. Behind this is a pool. The dive operators do not have a mooring here so you get dropped in close to the wall. 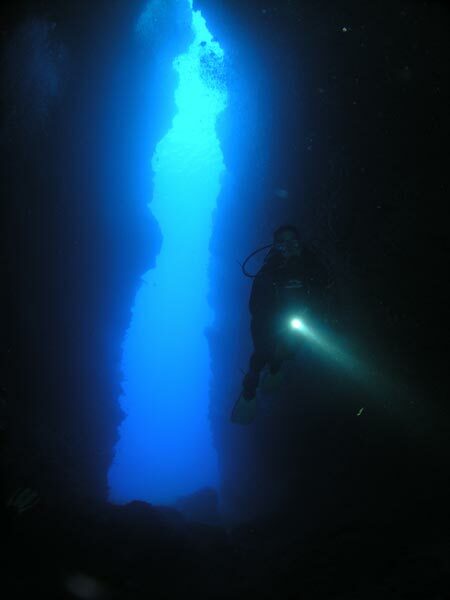 Once in the water, you drop to the bottom of the wall which is about 20 metres deep. You should see the entrance to the cave straight away. This has crushed coral as the bottom and is about 15 metres wide here. Head into the cave. If you look up, you will see that a lot of light enters the fissure. The walls start narrowing and soon it is only five metres or so wide. There is a dog-leg to the left and it gets a lot darker. Now you can see the light streaming in from above. This can look amazing. There is a sort of round "room" here with lots of boulders on the bottom. It can be pretty dark here once you move out of the direct sunlight. It is hard to get good photographs, all mine came our blurred due to the lack of light. A torch is definitely an advantage on this dive, although not essential. It is about 40 metres from the entrance into this spot. It is only a little shallower at this spot, perhaps 18 metres. After about seven or eight minutes, it is probably time to head out. Take your time, examining the walls and bottom as you go. 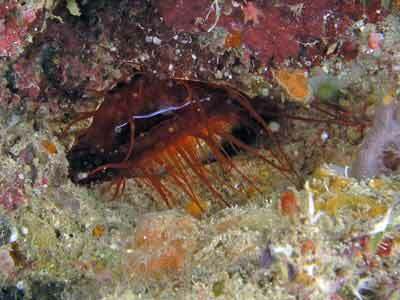 Some of the things that can be seen are firefish on the walls and even more. 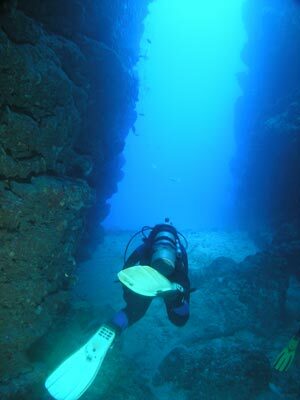 When we dived here, Kelly found a couple of electric clams in little holes in the southern wall wall. 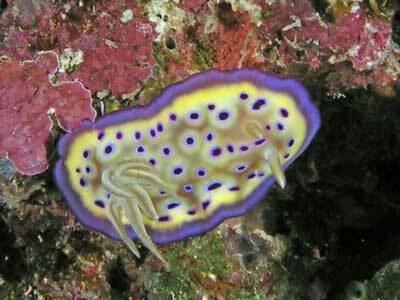 The electric clam is amazing to see, We had previously seen them in Kavieng. They look like they have shooting flashes of electricity runnung from one side of their opening to the other. For the ones here, they only were visible when a torch was shone on them. In the photograph above, you can just make out the flash, but in real life it is quite brilliant. Of course, the eflash is not caused by electricity, but by phospherence. Once you have exited the cave, head right. The reef wall here runs to the north. The wall drops to 30 metres and then slopes further away to perhaps 40 metres. The reef is quite nice along this section of the dive. 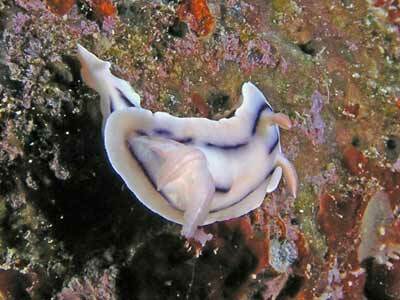 All along here there are lots of nudibranchs. I have added photographs of four of them to this page. 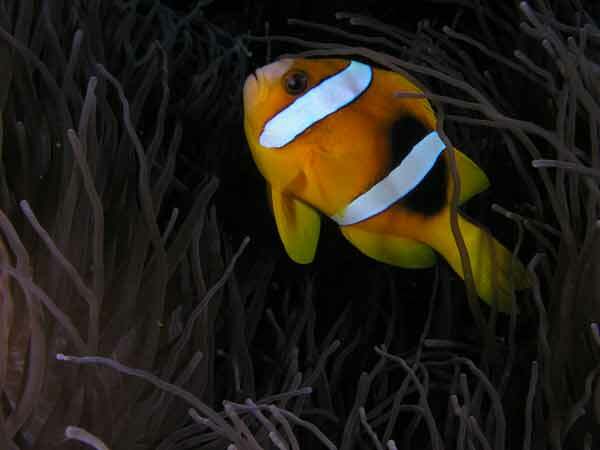 This section of the reef alos has a few titan triggerfish, so be aware of them in the mating season (normally about September from memory) and some yellow flutemouths. The wall has a lot of cracks and gullies. There are small ones and some alrger ones. This whole section of reef would be a good spot to do just a normal dive, and not drift past on your way to somewhere else as we did. It is a fair way to the mooring, and on the times we have dived here (and not dived while we did surface interval after a deep dive), only Kelly and I managed to be able to make it ot the mooring. It is a long way, so do not be worried if you do not make it. 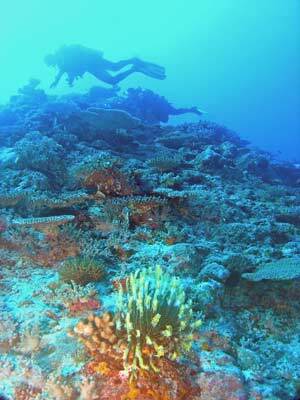 As the reef here goes rigght up to five metres, you can gradually ascend and never get into decompression. Kelly and I did 64 minutes on this dive, spending the last 10 minutes shallower than 10 metres and doing our safety stop on the reef top. We saw lots of anemones together with claowfish. Towards the mooring, there are some really excellent vertical walls and large gullies. Again, this section is well worth a dive on its own as it appears to be very interesting. The mooring is in about 12 metres (that is, a little off the main reef wall). As I mentioned, it will take at least 60 minutes to do this dive if you want to get to the mooring. I reckon is about 200 to 250 metres from the cave to the mooring in a straight line, a little more considering the reef has a slight curve.